LANSING, MI – Gov. 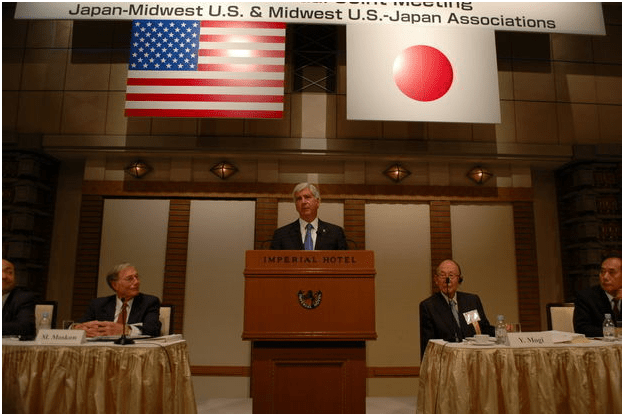 Rick Snyder this week led a state delegation to China, where he hopes to woo Chinese investment and tourism. A concurrent trade mission is being led by the Michigan Economic Development Corporation, which heads up the state’s tourism and economic development efforts. This trip includes nine Michigan companies that are looking to China for business opportunities. • In 2013, Michigan ranked eighth in U.S. exports to China. • Over the past eight years, Michigan exports to China have risen almost 500 percent. • Michigan companies exported nearly $4.1 billion in goods and materials to China in 2013. So what typically happens on a trade mission? A year ago, MLive Reporter Melissa Anders joined the state delegation to find out. Learn about the trip and see examples of somecompanies that have participated in the past. This time around, Snyder and the Michigan delegation will lead trips to Beijing, Shanghai and Guangzhou. At that last spot he’ll be vising the Guangzhou International Auto Show. • Air and Liquid Systems, Inc. Previous trade missions to China have already brought $1 billion worth of investment to the state, according to information provided by the Governor’s office. The mission began Nov. 19 and last for a week. According to the Associated Press, Snyder’s 2013 trip to China and Japan cost $251,000 and the concurrent MEDC trip cost $173,000. Of that, $219,000 was covered by MEDC “corporate” funds, money the MEDC gets from Native American casino agreements, and $32,000 came from the Michigan Economic Development Foundation, a non-profit. Emily Lawler is a Capitol/Lansing business reporter for MLive. You can reach her atelawler@mlive.com, subscribe to her on Facebook or follow her on Twitter:@emilyjanelawler. Sorry I didn’t vote this year. I tried, but I depended on the Chinese Postal Service and apparently, the US Mail. That collaboration failed. I was promised seven business day delivery. If you don’t count the day I dropped the ballot off at the China Post Office. It was 9 days, 7 business days to the election. I paid 185 rmb, about $30 to vote this year and the ballot didn’t arrive until November 12, eight days after the election. Thanks for your note. I take it that you received the envelope on the 12th. That is a far cry from the seven business days that they guaranteed. We have some serious credibility problems with the post. It was received in the USA on November 7 after a flight that apparently lasted for ten days. It went into US Customs on the 7th and out about noon on the 8th. If the USA side was competent the package should have been delivered on the 10th. Perhaps that was a holiday. They claim attempted delivery on the 11th, and still no record of delivery. Yikes. I have a website for foreigners in China at www.tourguizhouo.net . I plan to put this email and your response online for the benefit of other people who want to vote in the USA from China. Do you know the date and time that the ballot was delivered? Did it come via US Mail, or a private carrier? Thanks for your help. “THERE is an exciting feeling of a new beginning,” says John Pottow, a bankruptcy expert at the University of Michigan. After years of decline that ended in disaster when Detroit filed for bankruptcy last year, one of America’s biggest cities has been given a new lease of life. Today Steven Rhodes, a bankruptcy judge, approved Detroit’s plan for the adjustment of debts that will allow the city to slash $7 billion of unsecured liabilities off its $18 billion debt mountain. Detroit has a long history of mismanagement. But the handling of its bankruptcy so far has been a textbook example of efficiency and pragmatism. Much of the credit for getting Detroit back on track in less than 16 months must go to Kevyn Orr, the bankruptcy lawyer appointed by the state of Michigan to sort out the mess. Mr Orr had the powers of a “benevolent dictator”, says Mr Pottow, and he used them well. Under the agreement both pensioners and bond holders will take pain, albeit at varying degrees. The pensions of retirees will be cut by 4.5% and the cost-of-living adjustments (COLA) will go. Retirees from the police force and the fire brigade will have to live with a reduction in COLA from 2.25% to 1%. Health-care benefits will be reduced by 90% for all retirees. Bond holders, such as Syncora, a bond insurer, had to accept a huge haircut. Syncora will get 26 cents on the dollar. Another bond insurer with a claim of $1 billion, Financial Guaranty Insurance, had to accept big losses. Mr Orr managed to save the art collection of the Detroit Institute of Arts (DIA) from sale in what is referred to as “the grand bargain”. 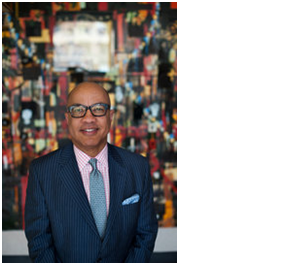 Foundations, private donors and the state of Michigan raised $816m to protect the DIA from the city’s creditors. The funds raised will help to pay public worker’s pensions—and the ownership of the museum was transferred from the municipality to an independent charitable trust. The adjustment plan approved by the judge sets aside $1.7 billion over the next nine years for investment in basic services and infrastructure. It is a vast sum for a city that has trimmed investments to a minimum in recent years, but Detroit’s needs are such that this pot could run out in as soon as five years. The city must rebuild its credibility, otherwise no one will lend to Detroit, says James Spiotto, a bankruptcy expert at Chapman Strategic Advisors. After a judge approves a bankruptcy plan objectors have 14 days to file appeals. Yet appeals are unlikely at this stage as the tough battles with retirees and creditors have all been fought. Many are now optimistic about Detroit’s chances for recovery. “It can be done,” says Mr Spiotto. His colleague, Mr Pottow, compares the city to an alcoholic who has sobered up. The question is whether Detroit will have the strength and support to avoid past temptations of profligacy, mismanagement and corruption. As a Michigan (ex)patriot I have followed the bankruptcy of Detroit and the plight of the US cities. My background includes both real estate appraisal and politics. Chinese are often pointing to Detroit as an example of why their system is better than the American system. That hasn’t deterred Chinese from investing heavily in Detroit, at what many consider bargain prices. The Michigan election is in the can and so is the bankruptcy proceeding for the City of Detroit. The solution to the immediate crisis of Detroit was part political and part financial. The Michigan Governor, Rick Snyder, was re-elected and details of the uniquely American solution to the Detroit malaise (as reported in the NY Times) has emerged . . .
At the center of Detroit’s swift exit on Friday from the nation’s largest-ever municipal bankruptcy is a $816 million deal that has come to be known as “the grand bargain,” an improbable arrangement hashed out in many months of behind-the-scenes negotiations with foundations, the State of Michigan and the Detroit Institute of Arts Officials in Detroit celebrated “a new day” after a federal judge approved a plan to bring the city out of bankruptcy. So for the mediators, the thought of solving both problems in a single swoop was tantalizing. Not long after the city filed for bankruptcy in July 2013, Judge Rosen had jotted a note to himself — one some involved now point to as a historic document — with the words “state,” “art” and “pensions” and arrows between them. The Kempinski Hotel had another theme party for Halloween. Located near Dong Men and Xiao Shi Ze, the Kempinski’s sixth floor Paulaner Brew Pub hosted a Halloween party. The place was decorated appropriately and many guests had Halloween costumes. And finally, some papers are discussing the “credibility” of China’s national English test after top universities in Hong Kong recently refused to recognise the system. According to the Southern Metropolis Daily and the Beijing News, University of Hong Kong and Chinese University of Hong Kong have announced that they will not accept the scores of the mainland’s College English Test (CET) for admissions. Instead, they have asked applicants to submit scores of the International English Language Testing System (IELTS) and the Test of English as a Foreign Language (TOEFL). Reflecting on the decision, an article in the Henan Business Dailycriticises the mainland English language education for its emphasis on memorising grammar rules and vocabulary, but not on practicality. “Some students have obtained high marks in the test, but they are not able to communicate fluently and are ‘deaf’ (when it comes to listening skills)…,” it says. BBC Monitoring reports and analyses news from TV, radio, web and print media around the world. For more reports from BBC Monitoring,click here. You can follow BBC Monitoring on Twitter and Facebook. 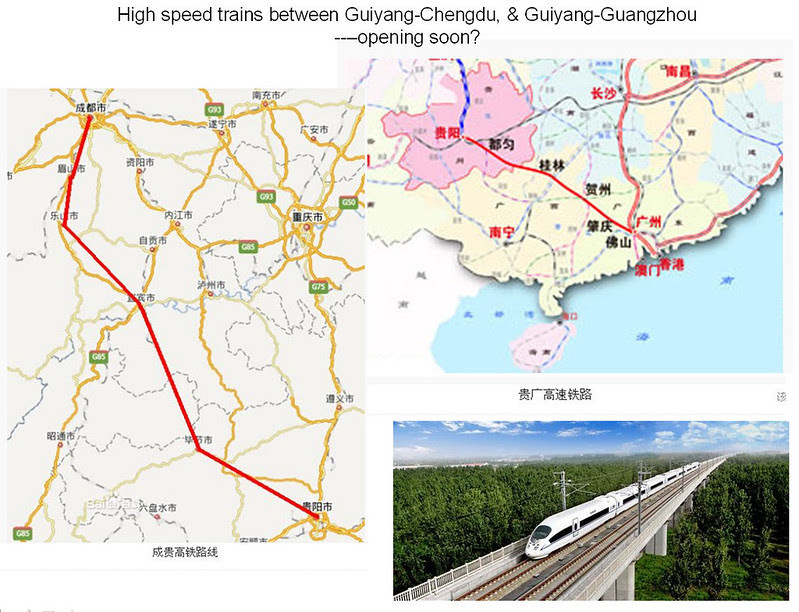 The joint commissioning and integrated testing of the Guilin-Liuzhou section of Hengyang-Liuzhou high-speed railway started on July 19, 2013. The Guilin–Liuzhou high-speed rail is expected to open this year, with a travel time of only one hour between the two cities. The Hengyang-Liuzhou high-speed railway serves as an important part of XiangGui (Hunan to Guangxi) railway expansion renovation project. 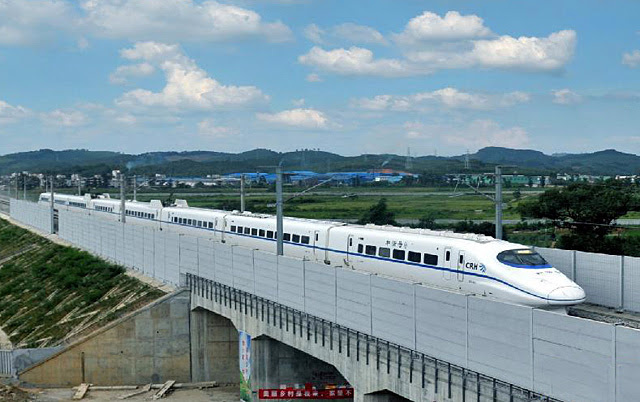 It is the first one to make the testing and commissioning among the high-speed rails in Guangxi. This 497.9-kilometer-long rail route is expected to put into operation on a trial basis, in August, and be ready to open at the end of 2013. 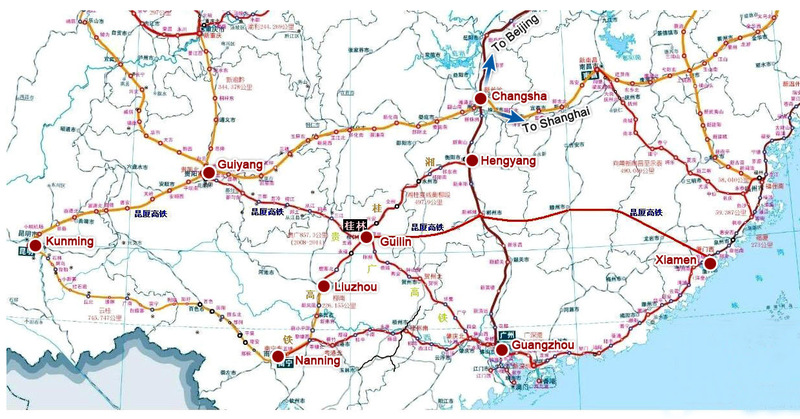 The Xianggui railway, a 723-kilometer track, links the city of Hengyang, Hunan province and Nanning, the capital city of Guangxi; And, the Guiguang high-speed rail, linking the city of Guiyang, in Guizhou province, with Guangzhou, the capital of Guangdong province, will pass through Guilin. It is reported that as many as seven high-speed rails in Guangxi are expected to go into service this year. Thus, Guangxi is stepping into an era of high-speed railways. For travelers, it will be possible to enjoy the Guilin sunshine of a morning, go shopping in Guangzhou after 2 hours, and taste the famous Peking duck in the evening.